SRSim combines rule-based reaction network models with spatial particle simulations allowing to simulate the dynamics of large molecular complexes changing according to a set of chemical reaction rules. As the rule can contain patterns of molecular complexes and specific states of certain binding sites, a combinatorially complex or even infinitely sized reaction network can be defined. 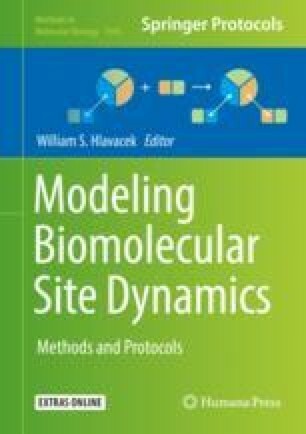 Particles move in a three-dimensional space according to molecular dynamics implemented by LAMMPS, while the BioNetGen language is used to formulate reaction rules. Geometric information is added in a specific XML format. The simulation protocol is exemplified by two different variants of polymerization as well as a toy model of DNA helix formation. SRSim is open source and available for download.